The crackling sound of a lit fireplace is a staple during this time of the year. However, are you sure that your fireplace is safe and properly maintained? If it's not, a disastrous mishap could take place in your home. To help you be sure that your fireplace is in shape to make your home warm and cozy, read the post below. Before you do anything else, you need to learn the condition the fireplace is in, so you can then take the appropriate measures to keep it in mint condition. To that end, you will need to grab a flashlight and inspect the flue thoroughly. While you're in there, notice if there's any creosote or soot buildup. Likewise, it is important that you check the smoke's exit and verify that there's nothing blocking it (it's not uncommon to find birds' nests and dead leaves up there, so look for them). Once you have a better idea of what the condition of your fireplace, it's time to start working on getting it clean and into shape again. If, while inspecting the flue, you noticed that it was in bad condition, you can call a professional chimney sweep that can take on this task expertly. However, if you will be doing it on your own, make sure to get as much dirt as you can off of the flue. While you're at it, remember to inspect the cap at the top, and to replace it if it's not in the greatest condition. 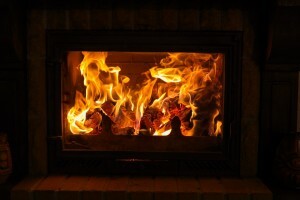 After you have cleaned the fireplace's flue thoroughly, you should start using it. While you do, however, keep your eyes open and your full attention on it. This is because it is important that you notice its functioning, and that you can point out if anything unusual happens while you use it. For example, you should note if there's more smoke coming out of it than what is normal. Whatever issue you find with it, turn the fireplace off and avoid using it until you address and fix the problem, so as to not put your safety at risk. If a fire, a flood, or another mishap has taken a toll on your property, trust in Walker & Frick Construction Co. in Richmond, VA. Call 804 282 1281 to learn how they can assist you in this difficult time. If you want to make the most out of your fireplace (as well as delay the time between clean ups as much as possible), you should burn only the appropriate materials in it. For instance, going for a hardwood to burn in your fireplace (maple and oak are good options) is a safe bet, since they will last a lot longer than softer woods (such as pine). Not only that, but they don't leave as much residue behind, meaning you won't have to worry as much about your fireplace's cleanliness. Of course, your fireplace should be as safe as can be, lest you want a disastrous fire to engulf your home. For that reason, you should look into a few extra safety features you can add to it to keep any danger at a minimum. One of said options is to install a stainless steel chimney liner to improve the efficiency of the flue. Another thing you can do is put heat-proof glass doors around it, so that children or pets don't get too close to the flames. Last but not least, it is imperative that you get your fireplace checked by a professional if you want it to remain safe and functional. Calling an expert team at least once a year will help guarantee that your fireplace is in the right condition. Moreover, they'll be able to notice any issues and provide the necessary repairs so that your fireplace isn't a danger to you, your family, and your home. If your home is in dire need of some professional property restoration in Richmond, VA, contact Walker & Frick Construction Co. to do it for you. Call 804 282 1281 to inquire about their services, or to get a free estimate.